A Charleston, SC Travel Guide! Summer is on its way out, and cooler weather is right around the corner. Let’s not run to Starbucks for our PSL’s just yet, because it is only right to give summertime the proper goodbye it so deserves. What better way to kiss the heat goodbye than by planning a last hoorah mini-vaca to my favorite place on the planet: Charleston, SC. 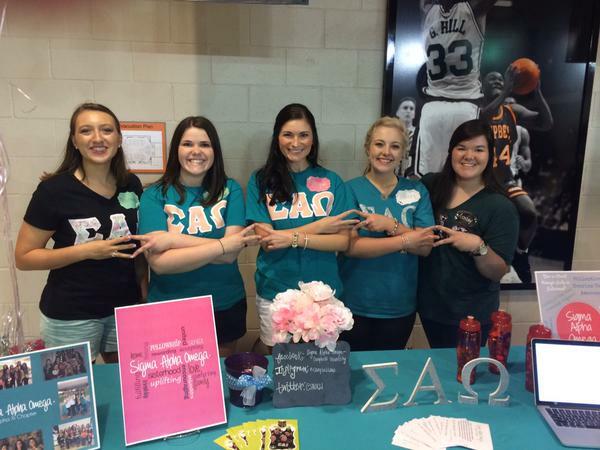 Featured Friday: A Sorority Sister's Guide to Recruitment Week! When Courtney asked me to do a sorority-themed piece for Wonderfully Wolf, I was SO excited! I absolutely love Courtney & her blog! We rushed Sigma Alpha Omega together as a part of Alpha Class and I enjoyed growing closer to her through our sisterhood. I also enjoy living vicariously through her blog while I sit in my apartment and look at all the textbooks I have to have for the semester. This year, I'm so thankful to be the recruitment chair for our spring recruitment! Planning is already well underway and I'm excited to share with you what the most important things for sisters are during rush week. For those of you who don’t know me, I’m the “other” Courtney. Courtney Wolf and I became fast friends last year at Campbell by working closely together in our sorority, Sigma Alpha Omega, and our friendship quickly grew into weekly Scandal dates, grabbing Starbucks between classes when Court should have been at work, and the understanding that we were both down for a venting session whenever the other needed it! I have just returned from two weeks in Armenia, and I am thrilled that Courtney has asked me to share some thoughts on my experience overseas with you all this week! How to Live like it's Summer All Year Long! Sweet and Healthy Treats to Beat the Heat! I know most of us are ready for college football, fall, and Pumpkin Spice Latte’s but summer’s not over yet! Heather has created an awesome guide to healthy sweet treats to cool down when things heat up. My passion for nutrition has taken me through winding "Rhodes" of what my opinion of "healthy" eating is. I believe in balance, real foods, convenience, treats, and so much ice cream. What I think is healthy for me may not be a nutritional philosophy that's best for you and that is so ok! My motto is "you be you!" Today, I've put together some summer treats that can be easily rearranged to impress varieties of different taste buds. My first post is featuring a summer color combination that I am absolutely CRAZY for this year: white and tan! It may sound somewhat “vanilla” but with a good summer tan (or a great self-tanner! I recommend Jergens Tanning Mousse) this combo truly pops! Being a true Southerner, white is one of my go-to summer staples. If you’re searching for a new pair, these white jeans from Target and these from Macy’s are great options. Remember, finding jeans that fit you correctly may take time so be patient!